See? The bear is used to help express the griever’s emotions, so theoretically, any mouth would be “wrong” at least some of the time. 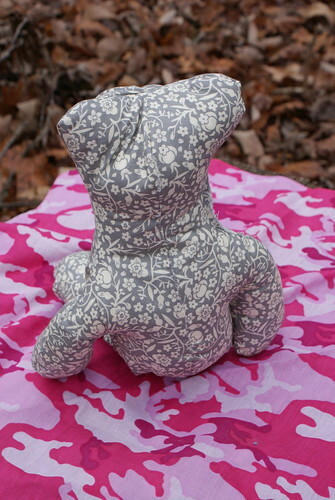 Or… she sewed, and found it bearable, making a mock-up Bearables Bear. But first, I’d be remiss if I didn’t note that we had another great report on Sissy’s only eye yesterday. Several of you know that I want to learn to sew. Well, last weekend, I sewed. I am most definitely still learning, but I have a finished object to share and Gretchen Greer has a new beloved that smells very much like Mama and some other unknown to her things. First things first… the disclaimers and credits. 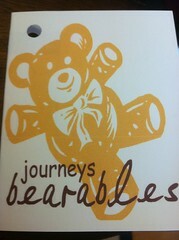 Bearables are a tool in a program through our local Hospice. 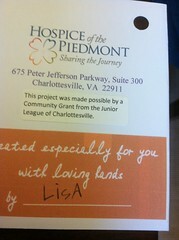 We learned of it when they applied – and received – a grant from the Junior League of Charlottesville to fund bear making supplies -these cute tags, stuffing and such… the fabric comes from the Hospice patient. (Fall 2012 grants were announced late in 2012 and haven’t been posted to date on our website, but trust me… they got a grant.) 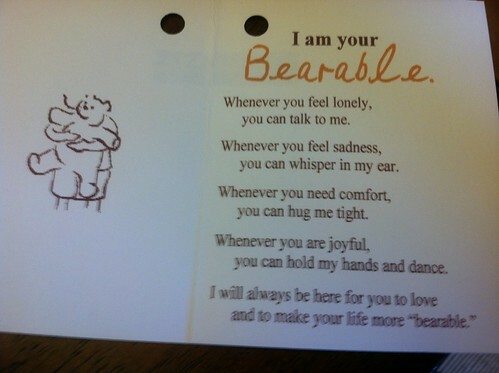 The tag images shared are the property of HoPVa and the Bearables program. If you are inspired, please follow the link(s) and ask permission. To become a sewing volunteer, one attends a training (check) and learns about the program, why the bears might have embroidered eyes and noses, but never a mouth, how to care for the fabric for said bear, etc. Then, she makes a practice bear (check) and someone from the program inspects her work. (No check, by mutual agreement.) As a JLC member, I have two options, if ever I am comfortable with my own craftsmanship. I can either work directly with HoPVa and get on the bear-maker list, or I can let the JLC coordinator know that if ever there’s a call for a group of bears to be made, I’m comfortable getting together en masse (read: with moral support and technical assistance available) to make bears together. Right now, my plan is to get better acquainted with my sewing machine (Singer Promise 1409) and then attempt another practice bear on fabric that means nothing to anyone. Then, due to the regulations of the program (fabric cannot be washed or exposed to pets), I will most likely only offer to participate in a JLC-run program where one of our members whose pets do not rule the roost would be responsible for picking up the fabric and keeping it and the finished bear safe until it arrives at the HoPVa. 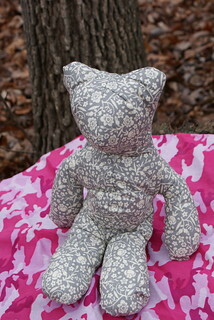 Yes, I have the pattern and a PDF copy so I can in theory, make as many practice bears as I need to. I have also purchased the Colette Sewing Handbook, and will try to use it. Again, each seamstress is encouraged to personalize the bears. The League member showing us the way does nice embroidered eyes and a nose, then ties a pretty ribbon around the bear’s neck, while the most prolific of the bear-makers never does eyes or noses, but always finds an extra to make each bear special. It might include lace from the special item of clothing, a knapsack accessory or a pocket, but she lets each source fabric – an item of clothing belonging to the deceased, selected by the grieving family member – inspire her. Gg likes Mr. Grey unadorned… I’m sure of it. While I do confess that I’ve sewn with a sewing machine before, this is the most success I’ve had as an adult. I’m pretty sure there was something seriously wrong with my former machine, as it definitely wanted a lot of tinkering and adjustments, right out of the box. If I knew then what I know now, I would have returned it… if I hadn’t bought it on super-clearance at a going out of business sale some nearly 20 years ago. Hem. My little machine is listed on the Singer site under “very basic”. Well, duh?! That’s just what I need. I can’t imagine I’ll ever want more, but then if we revist my first posts on spinning… well, let’s not and move on, eh? There’s Mr. Grey’s back. I’m actually happier with my hand stitching than anything else. Can you even tell – without enlarging the photo; let’s be realistic here – where he was left open for stuffing purposes? More candor; if I may be so modest, while I am no seamstress, I have cross stitched and embroidered since my single-digit years. Oh, and I stuffed him well too, I suppose; he does sit upright all by himself, with only a little encouragement (think bend his head to his knees). So, I sewed. I liked it enough I snagged a thread box, a neato pin cushion bottle thingee and new scissors that same night. Now, I need more fabric, interfacing (the iron-on kind), thread if the fabric isn’t a lot white, and… ?? But first, I think I’ll re-cover the Knight’s favorite pillow. If I actually learned anything, I measure, add generous seam allowances all around, cut, pin, sew, shove, hand stitch closed…. right? It’s a weird, dense pillow that I believe my mother made so long ago we’ll assume it’s a lady pillow and not discuss its age, okay? Any and all advice is appreciated, because I know several of you are accomplished seamstresses yourselves. While we’re on the subject – sorta’ – I’m going to make a case for craft-stashes, inspired by Alison’s post. No one thinks it’s hoarding when a painter has extra brushes and colors, and in fact, we’d all likely find it strange if a baker only bought precisely the ingredients/amounts she needed and never had an extra can of evaporated milk in the pantry, right? So why are knitters and sewers made to feel like hoarders when they “collect” supplies they know they’ll use eventually? Granted, all things are relative. This former sock knitter has an insane amount of single-hank/ball/skein inventory. Good thing my younger friends are having a baby boom, eh? Anyway, I’d love to hear your thoughts… whether they related directly to this post or not! Happy Dogs on Thursday, little friday and Thankful Thursday! Gretchen blogged a bit about coats over on their blog, but I have a kinda’ dog related post of my own. No fabric has been purchased. Don’t rush the process. The Knight even offered to buy me a new sewing machine, but I don’t think that’s necessary. Might increase expectations, if nothing else. On a happier note, I’m so thankful for friends who give me that nudge when I need it. Sometimes, I need to be challenged! I don’t even know about a favorite pattern. I mean… I can almost track my knitting “career” by the ruts I’ve gotten into along the way. First, I did scarves, because I was new and nervous about trying anything too advanced. Then, I did felted bags, and rather quickly moved into the sock phase. Then, lace took over. Shawls, shawlettes, socks, scarves… LACE. Now, I’m wondering if I’m entering a sweater phase. It’s too soon to tell. Of course, I’d like to hear from the sewers too. Where should I start? I’m thinking throw pillows are a good place… assuming I do more than just talk about sewing. Feel free to suggest a pattern or ten, but really, it needs to be remedial!